Gingersnaps In The Morning: Calmaté Irene! Miraculously Manic Monday to you all, my little gingersnaps. Ooooh... see what I just did there? TWO adjectives in one day. That's for you Jamie. Just cause. 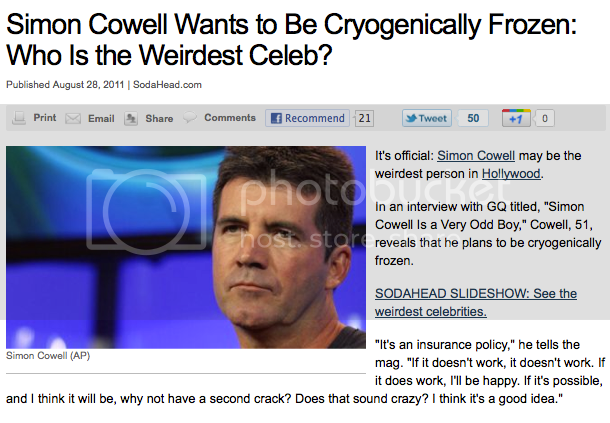 In other news, Simon Cowell has announced that he has plans to be Cryogenically Frozen. I thought he already was. What? So, were you guys watching the MTV Music Awards last night? Yeah, me neither. I did see this picture of Elvira Selena Gomez on the "red" (which was really black) carpet. All I can really think of is how my 5 year old daughter tells me that Selena Gomez is her favorite singer. Uh WTF?! Have I been playing any Selena Gomez music for her? No. Do I even know what Selena Gomez sounds like? NO. See, this is why I have been sheltering homeschooling my kids. To keep them away from Justin Pooper (our little nickname for him... don't throw things at me my dear Canuck readers), and other teenybopper attractions. So then I have to figure out how she decided Selena Gomez is the bomb. (Since my kids only watch pre-approved shows directly from our DVR) And you know how she's been hearing Selena Gomez? COMMERCIALS. Ugh. *hangs head* So much for using television as a babysitter. Why can't Adele be her favorite singer? Or Loreena McKennitt? WHY?!! Why must my girl insist on being her own person instead of being exactly who I want her to be? Oh yeah. Going for #motheroftheyear award again this year. It's not Christmas, but this card is just too good to save. I love this kid. Especially since it's not my kid. It's still funny. Hey, WTF?!! That girl and I have the same exact purple streak!!! I'm just not sure if I should be proud or scared. A female peacock is a peahen. Only the males (peacocks) have the beautiful colors. The real name of the animal is “peafowl”. Male peafowl are peacocks, females are peahens, and the babies are peachicks! Peacocks are the most famous, with bright blue heads, flashy plumage, and the long “train” of feathers that can make the shape of a giant fan. Contrary to popular belief, these feathers aren’t really tail feathers; the tail is underneath the train. Peahens, by contrast, are very drab in appearance and don't have the famous peacock feathers. They take care of the peachicks alone, while the fathers keep looking for more mates. Peacocks are polygamous; the bright colors are designed to attract more peahens. The prettier the peacock, the more peahens it can mate with. As a result, in modern slang, “peacocking” refers to men dressing in flashy clothes to get women’s attention. For example, Tom Haverford from Parks and Recreation tries to do this, with mixed results. 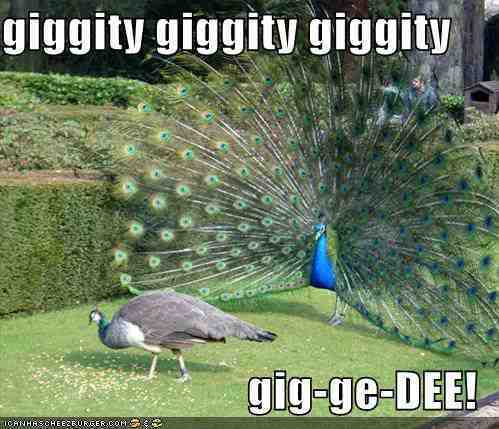 Peacocks also have a really loud call, to attract more mates from long distances. I confess to watching nearly 10 whole minutes of the VMA's, during which they showing Justin Beebs and Selena Gomez sitting side by side in the seats. My husband, who had just sat down asked, "Who are they?". I must confess, I've never loved him more than in that minute. I told him the truth. "Nobody. "...and that was my VMA's experience. I love how the reporter is hanging his head in shame at all the people that are NOT taking shelter. "What a bad example"...said the MAN WHO IS STANDING IN THE MIDDLE OF THE STREET DURING A HURRICANE!!! I don't need to see reporters being blown away to know how windy it is outside. Give your news team a break. Geez. @Christine, I agree... the reporter is the one standing in the middle of the street during the hurricane! And LMAO, Justin Bieber totally looks like a lesbian. Not that they all look alike and geez... *tries to get my foot out of my mouth* And in all fairness, I have never heard Selena G sing. I'll have to check her out. Probably. Possibly. Maybe.